When attached to fascia, our Smoothline gutters have the same appearance as half round gutters. However unlike the half round gutter, our Smoothline gutters have a flat back which makes them a little easier to fix, easier to paint and maintain and slightly more economical because it uses internal brackets. Smoothline gutter easier as well. 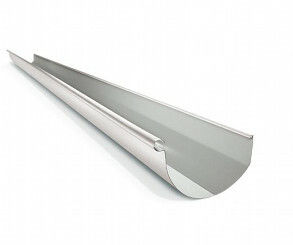 Stratco Smoothline is available for fixing to steel or timber fascias. The Smoothline is stronger than the traditional half round gutters, when fixed to a fascia, because there is more material sitting flush on the fascia, with the extra bend and suspension rib providing stiffness as well.